Like you said, fancy rats do make great first pets! As a domestic species, fancy rats are comfortable around humans and bond well with their owners. They don’t take up a lot of space and are intelligent enough to learn their names and some basic tricks. As a plus, they’re also fairly easy to litter train, which means that you won’t end up working as hard to keep their cage clean. Two rats are better than one. They keep each other company. 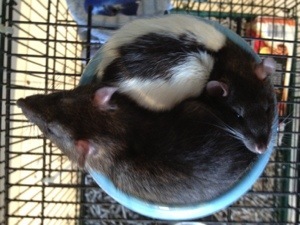 If you are planning to keep rats, I highly recommend that you keep at least two of the same gender in the same cage. Rats are colony animals and having more than one means that they don’t need as much human attention, so they’ll adapt easily to your kid’s moods and interests in them. Two rats can easily occupy the same space as a single rat and they’ll share toys, so they don’t require much extra resources to be cared for. Well, with Turnwise and Widdershins out of the way, Alarum is still very lonely. She’s been demanding my attention for petting and cuddles 24/7 and she’s also taken to squalling and fussing when I won’t let her cuddle up in bed with me at night to sleep. While I like how affectionate she’s become, I do also have to go to work and school, so I went to Newcastle to choose some new cage mates for her. It’ll be hard to find roomies the same age as Alarum is, given her advanced age, so I’ve decided to get two really young ones to keep her company. That way, she can treat them as her own children and they’ll also keep each other busy when Alarum is too tired to deal with them. With the horror that Turnwise and Widdershins have wrought on Alarum, I’ve learned a valuable lesson: Never ever buy pet shop rats ever again. Ever. I’ve also learned from keeping Nimhe that there are a lot of rat breeders out there with little or no quality control when it comes to health. Thus, I present to you my handy guide on how to choose a rat for your family. Firstly, when going to the breeder, or the pet shop, ask about the rat’s age and gender, then ask to be able to handle them. A breeder should definitely be able to tell you the exact date the rat was born, at least down to the month. A pet shop owner should at least know the rat’s gender, if nothing else. If they don’t know the answer to these questions, or won’t allow you to handle the animal at all, they probably have something to hide. Secondly, check for signs of temperament. It’s normal for rats to be skittish, but if they’re clawing at you to get away, or if they’re baring their teeth at you, then there’s something wrong with that rat – it’s not human-friendly and might turn feral later. I learned this the hard way with Turnwise and Widdershins. They were both somewhat aggressive towards me. A baby rat should be interested in you and active. Breeder rats should be especially human-friendly, since a breeder is expected to handle them daily and remove any feral ones. Thirdly, check for health. Do you hear wheezing or snuffling? A little bit of snuffling is all right, but wheezing is definitely NOT okay. Pay particular attention to the rat’s lungs. If you put your ear against the rat and hear wheezing, then this may be a sign of a rat that will grow up to have major mycoplasmosis issues. Finally, check the rat’s weight. A healthy baby rat should have some meat on dem bones! The ribcage should definitely not be visible. You might be able to feel it when holding them, but you should also be able to feel some roundness in the tummy area. 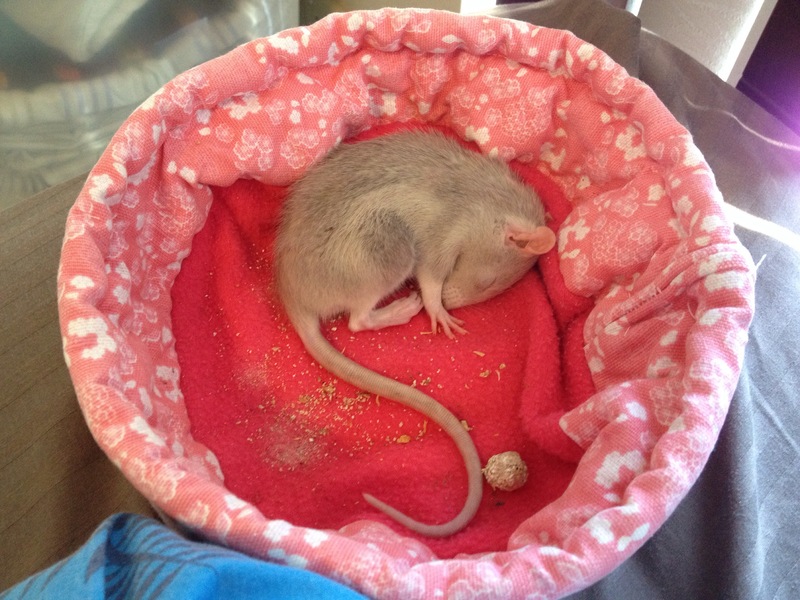 Nimhe was a skinny rat and she later turned out to be very unhealthy. Some types of rat do end up skinnier than others, though. Powderpuff rats, for example, can look and feel quite fat even if they’re average sized. Anyway, the two animals that I went to see passed the test on all accounts, so I put them in with Alarum. She seems pretty happy with them and they’re both extremely sweet and human-friendly. The new girls are called Cessnock and Fassifern, after some train stations on the Newcastle line. Cessnock (Cessie), a mink berkshire, is a big crybaby who complains all the time about her life, but she’s also not as excitable and active as her sister. 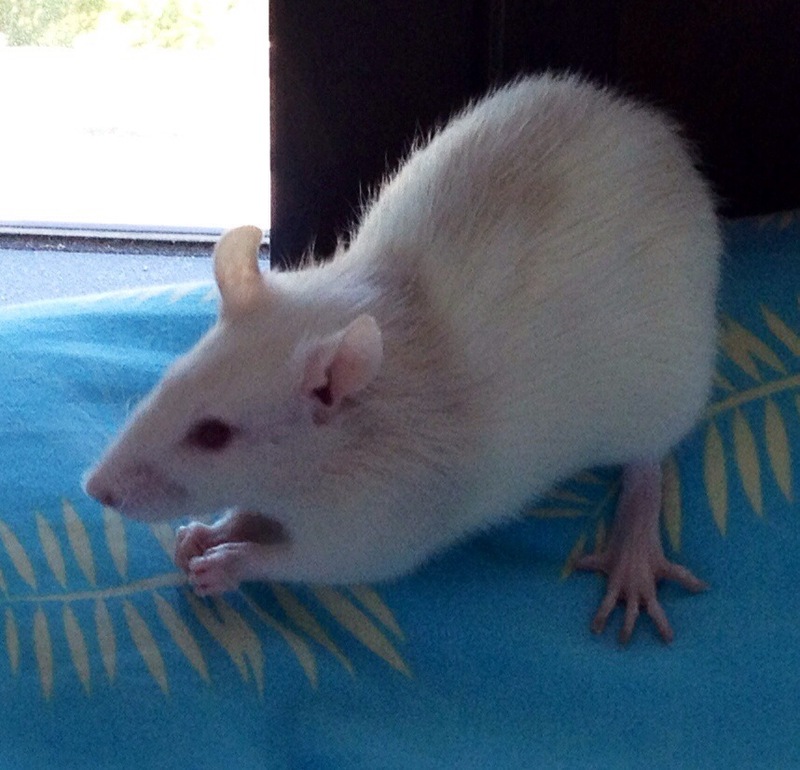 Fassifern (Fassie) is a boisterous champagne hooded who loves climbing, jumping and running. Overall, I’m pretty happy to have these girls as new additions to my miniature family.